Are the McKennas safe? Has The Dangerous Book for Boys TV show been cancelled or renewed for a second season on Amazon? The television vulture is watching all the latest TV cancellation and renewal news, so this page is the place to track the status of The Dangerous Book for Boys, season two. Bookmark it, or subscribe for the latest updates. Remember, the television vulture is watching your shows. Are you? 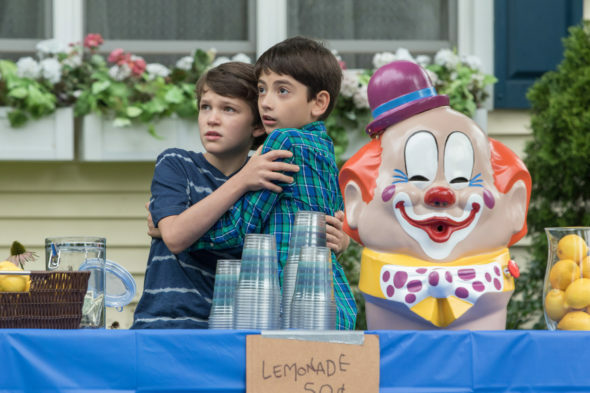 An Amazon Prime Video comedy-drama, The Dangerous Book for Boys stars Chris Diamantopoulos, Gabriel Bateman, Drew Powell, Kyan Zielinski, Erinn Hayes, Athan Sporek, Sophia Valinotti, and Swoosie Kurtz. Inspired by the book from Conn and Hal Iggulden, the series, from creators Bryan Cranston and Greg Mottola, follows the McKenna family, as they mourn and adapt to the death of Patrick (Diamantopoulos). In advance of his passing, Patrick created The Dangerous Book for Boys, for his three sons, as a user’s manual of sorts. The handbook inspires the youngest McKenna boy, Wyatt (Bateman). It also helps him maintain his connection to his dad and teaches him important life skills. The Dangerous Book for Boys has been cancelled so there won’t be a second season. Could it be revived some day? Stay tuned for further updates. Unless they decide to publicize viewership, it is difficult to predict whether Amazon will cancel or renewed The Dangerous Book for Boys for season two. For now, I’ll keep an eye on the trades and update this page with breaking developments. Subscribe for free alerts regarding The Dangerous Book for Boys cancellation or renewal news. 8/1/18 update: Amazon has cancelled The Dangerous Book for Boys so, there won’t be a second season. Details here. Find more of The Dangerous Book for Boys TV series news or other Amazon TV show news. What do you think? Were you hoping that The Dangerous Book for Boys TV show would be renewed for a second season? Are you sorry that Amazon cancelled this TV series, instead? Please make a second season, we loved it and cant wait to see what their dad left!!!! We loved this show! Please have a season two! I need to know whats in that box! Please we need a season #2!! LOVE this series!! Hope it gets renewed. My husband and I are 70, and we love this show! Great premise. Lots of imagination and great adventures. Please renew for a second season. Thanks! My 10 year old grandson and I watched all 6 episodes, he really liked it. He also likes the series stranger things. My wife and I are watching it with our 2 11 year olds and our 7 year old and we love it!!! My 9-year-old and I have been watching it and we love it!!! Hope it gets renewed. My 8 year old son loves it! !